The 2016 Honda Pilot is in stock here at Brilliance Honda of Crystal Lake, in the Elgin, IL area. If you’re looking for one of the best buys in the three-row crossover segment, you should consider the Honda Pilot EX. The Pilot EX is a value-oriented trim that gives you some high-quality features at a reasonable price. Find out more about the EX here at Brilliance Honda of Crystal Lake! The 2016 Honda Pilot gets a 3.5L V6 that makes 280 hp in all trim levels. The EX gets a six-speed automatic transmission and front-wheel drive standard. All-wheel drive is available, and the EX trim level is the first model to receive the unique dynamic traction control system that lets you pick between mud, snow, and sand settings, to dial in the traction and suspension systems you need. The Pilot EX is rated by the EPA at 19 mpg city/27 mpg highway/22 mpg combined* with front-wheel drive, and 18 mpg city/26 mpg highway/21 mpg combined with all-wheel drive. 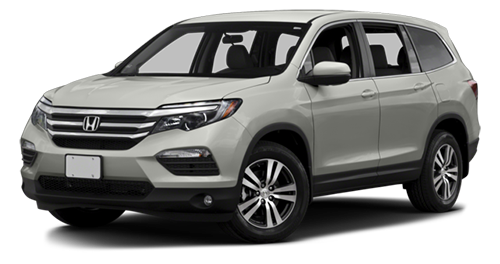 The 2016 Honda Pilot EX gets features like traction and stability control, anti-lock brakes, a rearview camera, and front, front side, and side curtain airbags, along with a rearview camera. The EX also adds dynamic parking guidelines for the parking camera. The EX is available with the Honda Sensing system, which includes adaptive cruise control, automatic collision prevention braking and warning, and lane departure braking and warning systems. Drive the latest 2016 Honda Pilot EX along with the rest of the Pilot lineup, here at Brilliance Honda of Crystal Lake, IL, the leading Elgin area Honda dealership. We’re located at 680 W. Terra Cotta Ave.. in Crystal Lake, IL, so stop by today!